Anglers often talk about the various windows in fishing and times when certain behaviors and patterns line up and make for some really great and easily patternable fishing. 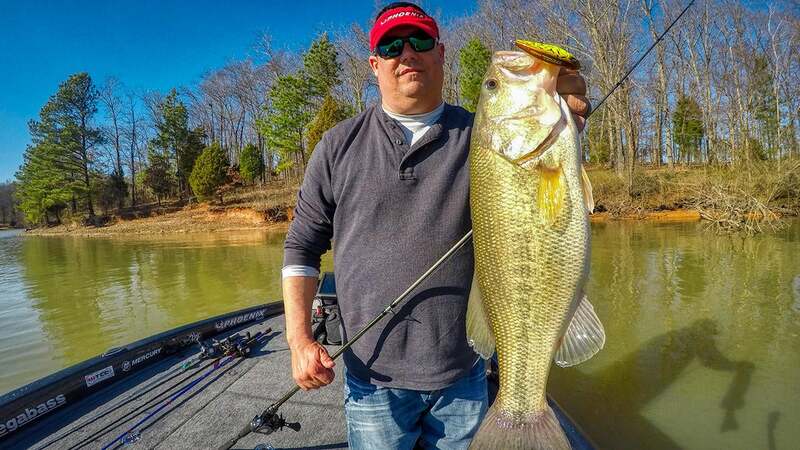 One of those windows for productive bass fishing in the spring is targeting bass in warming pockets. While most anglers realize the water is warming as the days get warmer in the spring, I’m still surprised at how many anglers overlook subtle nuances that can make one pocket 4-8 degrees warmer than the next one just based on its layout and a few environmental factors. And finding water that is that much warmer can be very important in the early spring fishing season. The key aspect for fishing warming pockets comes in protection from north winds. 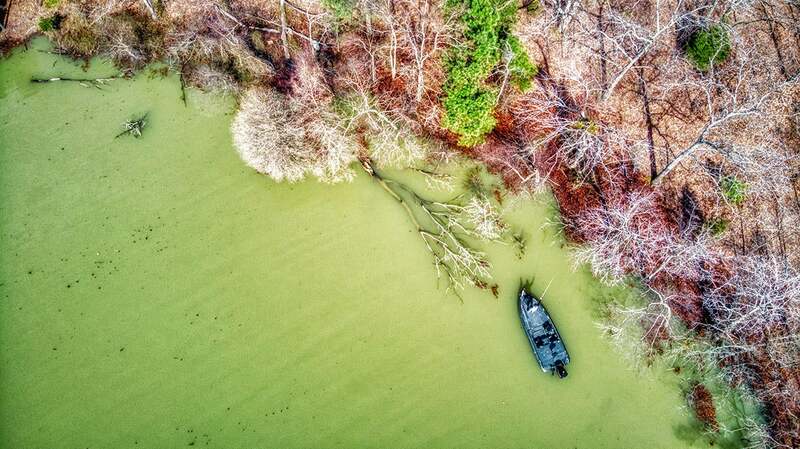 This is an age-old tale in bass fishing, but when the wind is blowing out of the north, run around to north pockets that have high banks or walls of trees or houses to block that wind and see if those pockets are several degrees warmer. On a sunny blowing windy day a few weeks ago, I found 52 degree water when the rest of the lake was 47. Every other one of those pockets I found like that would yield a 5 to 7-pound bass. And a few of the pockets had multiple big females up laying in the muddy waters warming for the impending move to spawning areas in a few weeks. If there is cover present in these protected heating pockets, then a bass will feel more comfortable with somewhere to conceal itself. 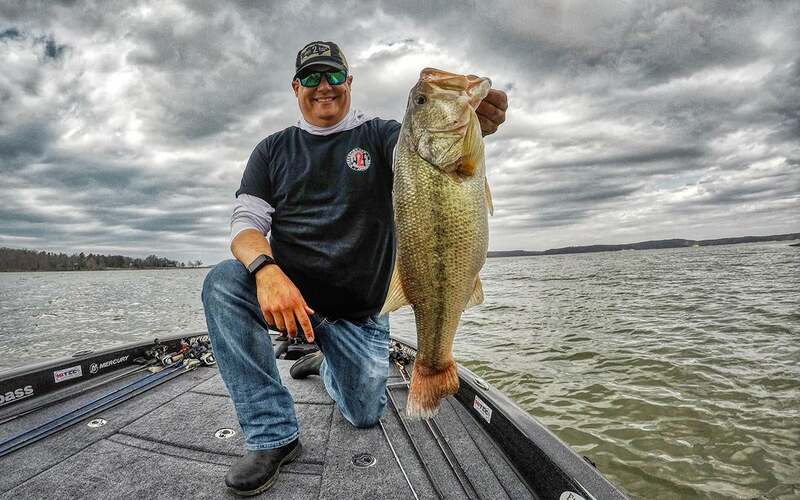 Sometimes just a few branches, big rocks or stumps in the water can be enough to hold a big bass or two. A laydown is my preference in this scenario. I think a bass that wants to sun in a shallow warming pocket is very comfortable on a big laydown. Sometimes the cover can be something odd like a culvert, a beaver hut, or just a clump of dormant or dead grass. 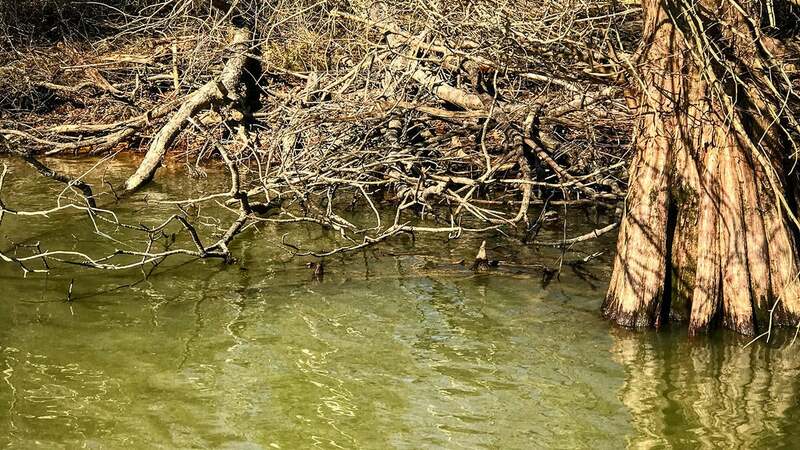 I found a beaver dam in the back of a protected north pocket yesterday that yielded 4 bass in a row. Sometimes the cover not only makes the spot more productive, but it focuses the fish into one small place and makes your fishing a lot more efficient. Now some of these north pockets can be very shaded and blocking the sun from big trees. To me that's less than ideal. Especially if the water is muddy. I want maximum sun exposure to get that water heating up and pulling the fish shallower making them easier to target and fish areas quickly. In fact I find the sun is more important than the cover. After recent floods the water had been way up into the cover. The water up in that cover was cold. 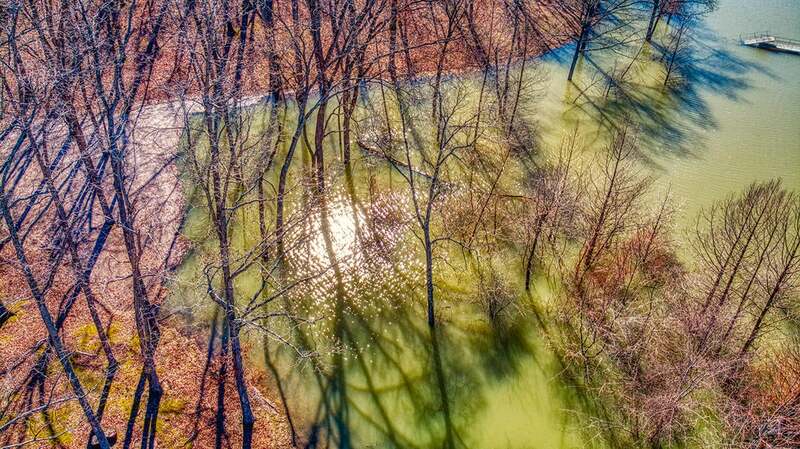 As the flood waters receded, the middle of these shallow warming pockets were where I found the bass. Even though there were laydowns, bushes, trees still in the water. The bass were right in the middle laying in the warmest water they could find. I figured this out late one afternoon and was able to slow roll a spinnerbait to a big bag on a blustery north wind. While the bass will definitely slide up there and warm themselves in clear water in shallow pockets, it's harder on us as anglers if the water doesn't have much color. I much prefer muddy water in this scenario. I actually think the muddier pockets were warmer this spring. I don't know the scientific reason why that would be the case, but I know that I caught a lot more bass in the muddy shallow pockets than I did the clearer, deeper pockets. Which makes me think, the bass are less spooky and skittish in muddy water. They will sit still and let you come into the area and fish without swimming off. Which is a lot more difficult for anglers and requires a lot more stealth in cleaner waters. I talked in another article about there being no such a thing as too shallow of water for bass fishing. I think at times a bass will lie with his back out of the water if he has to. I have seen bass in March and April run shad into inches of water and force them up onto dry land and then have to squirm and wiggle to get turned around and swim back out into the lake. 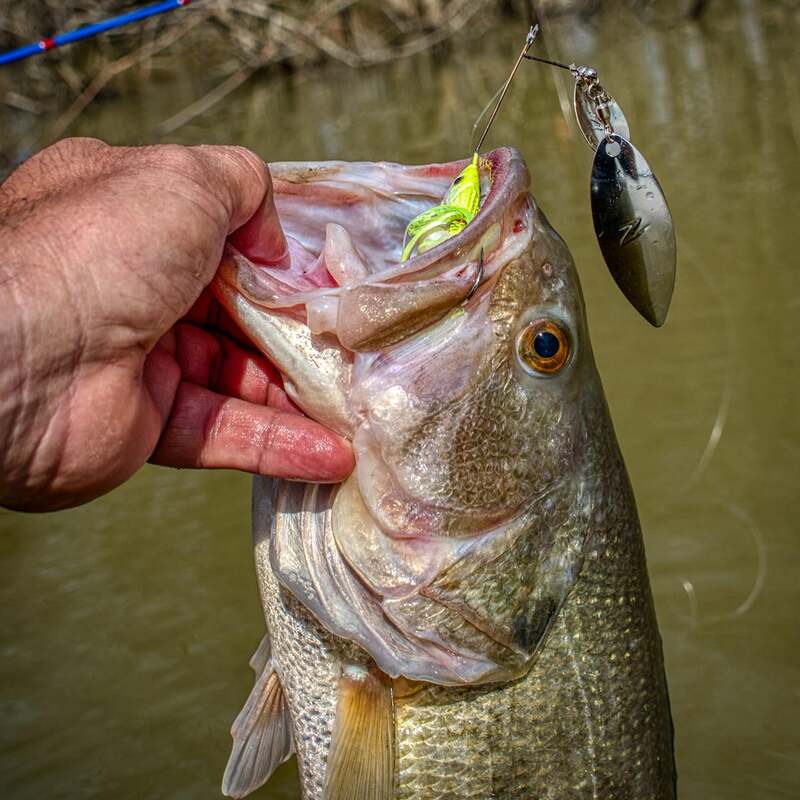 The bait comes shallow to feed as algae in the shallows comes alive and to warm up just like the bass do and often that is why the bass get dirt shallow in those first few weeks of warm ups. Because the bait did it first. So don't let water depth deter anything other than you running your trolling motor aground. I have a handful of confidence baits, and you probably do to for when the bass get shallow. But this time of year, I'm hard pressed to pick up anything before I pick up a spinnerbait. If the water is stained I will go with a willow leaf. If it's dirtier, I will go with double Colorado blades. I've been catching a bunch of good fish the last few weeks running a modified spinnerbait like a Booyah Willow Colorado Spinnerbait combo that I swap the willow for an Indiana or Colorado blade as the water dictates. I often buy willow/Colorado combo spinnerbaits and extra Colorado or Indiana blades and then just swap the back blade so I don't have to buy one of each spinnerbait. A lipless crankbait like a Booyah Hard Knocker or Strike King Red Eye Shad can be great baits to cover shallow warming pockets. And then when the water is not as muddy, I will usually throw something like a Zoom Swimmer or Jenko Booty Shaker on a weighted Trokar Swimbait hook or something like an Owner Flashy Swimmer. Look at your map and find those little tucked away north pockets that are just out of the wind, get plenty of sun but also offer a quick outlet for bass coming out of deep wintering areas and an easy place to pull in, warm their eggs and recoup in these warming pockets. If they have a little bit of cover in there too, then you've found a recipe for some big bites in the prespawn.